We English are a peculiar race when it comes to our history, often glossing over the less salubrious chapters. We invented concentration camps during the boar war, used them again in Indonesia and massacred hundreds of people during a peaceful demonstration in Amritsar. We even gloss over more recent history, including the evacuation of Dunkirk. Dunkirk (1958. 2 hrs, 09 min, 55 sec) is a war film directed by Leslie Norman. Given that the movie espouses a political message, one cannot watch the film without critically examining it on both these grounds and on the grounds of historical accuracy. On the one hand the film can be seen as an entertainment, but its message is pure propaganda as it tweaks history to fit a particular message. In a war where the visual medium became prominent, both sides engaged in propaganda. Indeed its uses continue today, and the idea that a picture count tell a thousand words became truer than ever, it just depended on who was showing you the picture. The film is told from three perspectives, which reflected the class system which existed, and to a great extent still exists. 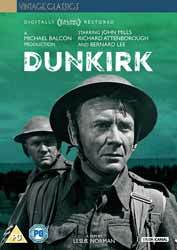 The first POV is working class Corporal 'Tubby' Binns (John Mills) whose small unit has been separated from the main army and spends half of the film getting to the evacuation area. They travel across enemy territory with Tubby continually telling his men that they should not give up and being plucky in a way that scared men are not. Richard Attenborough plays John Holden, a middle class business man and the nearest thing you can get to a weasel as he has so far avoided being called up to the army as his job is necessary for the war effort. That is not to say that he does not find his own pluck in the end, taking his small boat to the beaches. After all, it would not do to have a dissenting voice. Our last POV character is upper-class Charles Foreman (Bernard Lee) who has the education to see what a mess the country is in and has a spooky ability to know that putting Churchill in charge would change the Empire's fortunes. The film is a little more accurate than the Christopher Nolan remake in that it at least admits that it was the navy which was requisitioning and manning the small boats with only a small minority manned by their owners, but for some reason neither film thought that this would make for a better movie. So, plucky ordinary people we got and the myth of Britain is maintained. I rant on like this to remind viewers that this is not a historical record and the jingoism which it espouses is there for a reason. So, stripped of its message what is the film like? Post war there was a good industry in making war films. Although, tonally they remained similar backing up the idea that we had fought a just war, which is a fair assessment given the desires of the third Reich. Released from service, and with a great deal of the actual material readily to hand film makers could re-enact important battles with the actual equipment. I’m guessing that the framing of the narrative from the perspective of three different classes was designed to show that the whole of Britain came together in the countries hour of need. As actors Mills, Lee and Attenborough are at the top of their game and do what they can to flesh out what is little more than stereotypes. As Tubby and friends make it back to the beach, Foreman and Holden are caught up in the navies requisitioning of small boats. Foreman thinks nothing of taking his own boat and doing his bit, whereas Holden has to be shamed into coming along, taking with him young Frankie (Sean Barrett). You know not everybody is going to make it home. Tonally the film is a little downbeat, reflecting the director’s view that while the evacuation was impressive, it could not be seen as a victory. Filmed before the invention of CGI, the depiction of the chaos on the beach, with long lines of men standing waist deep in water, remain impressive. The only thing which lets these sequences down is how small the explosions are, but given that they are letting them off next to actors we can forgive this nod to safety. There are a few sequences, like the diving Stuka’s which used obvious stock footage. The whole film has had a 4k restoration on Blu-ray, so while the main stock remains clear and impressive the stock footage present a lowering of picture quality which is noticeable but not jarring. There is a good amount of extras on the disc. First up there is an interview with Sean Barrett (21 min, 23 sec) who has latterly mostly provided voice acting for games, but in some quarters found fame after his picture appeared on a Smiths cover. He recounts his memories of making the film. Dunkirk Operation Dynamo Newsreel (3 min, 54 sec) is actual film from the war with the unusually normal Mr. Cholmondley-Warner BBC voice over, which kind of makes this old film unintentionally funny. Young Veteran (1940. 22 min, 23 sec) is a short from the Ealing Studios which mixed library film and newly shot material to show the rise and fall of the first months of the war. Lastly we have John Mills Home Movie Footage (9 min, 59 sec). The film is silent, but in colour and gives a very good impression of what the film would have looked like if it had not been shot in black and white. So, as a war film its entertaining, if a little jingoistic for a modern audience. The acting is good given the constraints of the roles and the set pieces still hold up today. The disc come with two audio tracks, the original English track and a German dub.